The SPX, NAS, and NDX reached higher levels this week while the Dow remained under the recent recovery highs. The SPX rose to 2852 on Tuesday but then fell to 2812 before the FOMC decision on Wednesday. The Fed announcement caused an afternoon rally to 2842, but price declined again into the close. Price gapped lower on Thursday’s open with the SPX falling to 2817, but buyers stepped in quickly and the SPX rallied to the weekly high of 2860. The SPX gapped down on Friday, fell to 2802, recovered in the afternoon, but sold off to 2801 into the close. Quite a volatile day and week! For the week, the SPX/Dow lost 1.1% and the NAS/NDX lost 0.3%. On the economic front, we saw an uptick in the Philadelphia Fed Index, Leading Indicators, and existing home sales. Factory orders and the NAHB Housing Market Index were unchanged. The FOMC held rates steady and announced the end of the Fed’s balance sheet reduction in September. Next week’s report will highlight housing starts, building permits, pending home sales, new home sales, consumer confidence, personal income, personal spending, Core PCE Price Index, Q4 GDP estimate, and the University of Michigan Consumer Sentiment Index. The ECRI WLI update has not been published this week. The foreign indices we track were mixed this week with considerable weakness in Europe and Brazil. The Indian Nifty 50 up 0.3%, the German DAX down 2.8%, the French CAC 40 down 2.5%, the Brazilian BVSP down 5.5%, the Japanese Nikkei 225 up 0.8%, the Hang Seng Stock Exchange up 0.3%, and the South Korean KOSPI up 0.4%. In the US, the long-term count remains unchanged. Super cycle SC2 low March 2009. Primary I high May 2015, and Primary II low February 2016. Major wave 1 high October 2018, Major wave 2 low December 2018. Intermediate wave i of Major 3 is now underway. We continue to track the three highest probability wave counts as discussed in last weekend’s report. The divergence between Dow and other major indices continues, so we favor our conservative outlook of a complex Minor 2 correction underway as shown on the Dow chart. Choppy price action suggests a corrective rally off early March lows and weakness into the close supports this view. 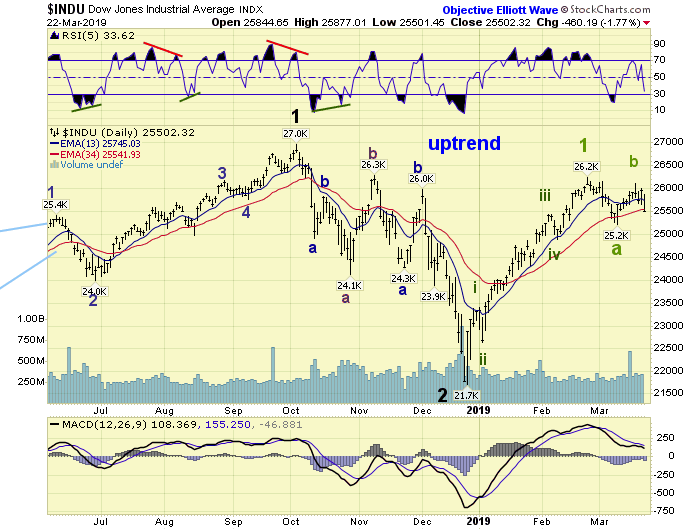 Should the Dow reverse course and rally to new recovery highs, this wave count may be eliminated. Minor wave labeling remains tentative until further price action is developed. The daily SPX chart shows the near-term bullish wave count with Minor 1 and Minor 2 complete at 2817 and 2722, respectively with Minor 3 underway. Early price action off the 2722 low was strong but has since become choppy. Strength in NAS and NDX has been supporting this wave count as well. 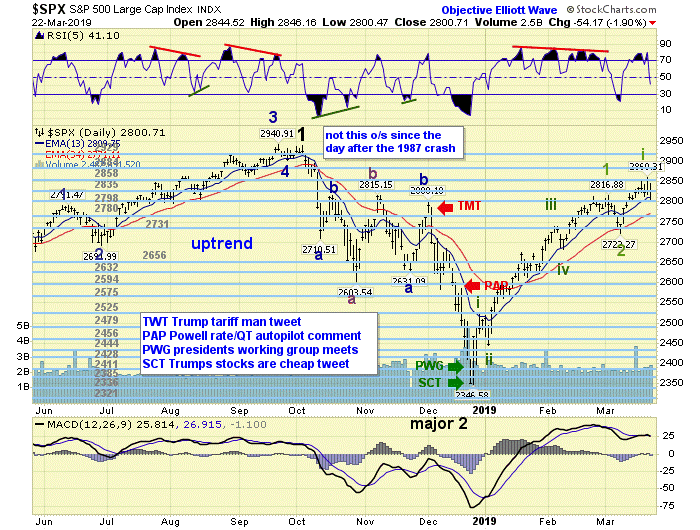 Sharp reversal on Friday was largest pullback of the rally so far and sufficient to qualify another wave, suggesting Minor 3 may be subdividing. For SPX, we can count three small waves up to this week’s high, 2852>2812>2860. This suggests either a corrective B wave rally, which supports our primary view of an ongoing Minor 2 correction, or an irregular subdivision for Minor 3 as noted on the SPX daily chart. Last week’s count showing Micro 3 of Minute v was eliminated due to overlap of Micro 1 and has diminished the possibility of a Minor 1 extension. Until SPX clears 2876 and/or the Dow reaches new recovery highs, trend weakness remains on the table. 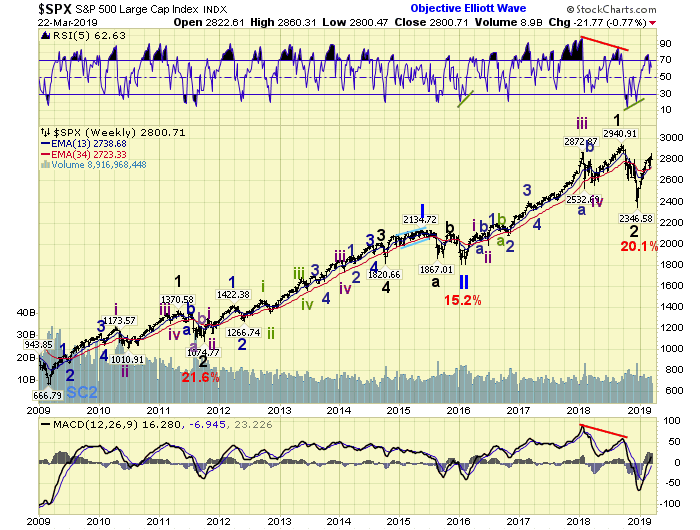 We will continue to track all of these probable wave counts, and again suggest patience while the markets remove the uncertainty through additional price action. We believe this uncertainty will be resolved in the coming days or weeks. Short term support is at the 2798, 2780, and 2731 pivots and 2722 low. Resistance is at the 2835, 2858, and 2929 pivots. The momentum ended the week neutral with a positive divergence on the 60 minute SPX chart. We’re in process of updating charts in the Public Chart List with current OEW status and hope to have that completed in the near future. Asian markets were up approx. 0.5%. European markets were down 2.5+%. The DJ World index lost 0.6%, and the NYSE lost 1.4%. Bonds yields are in a downtrend with the 10 year treasury falling 5%. Crude remains in an uptrend and gained 0.9%. Gold is in a downtrend but gained 0.7%. Bitcoin is in an uptrend and gained 1.6%. The USD is in an uptrend and was flat.